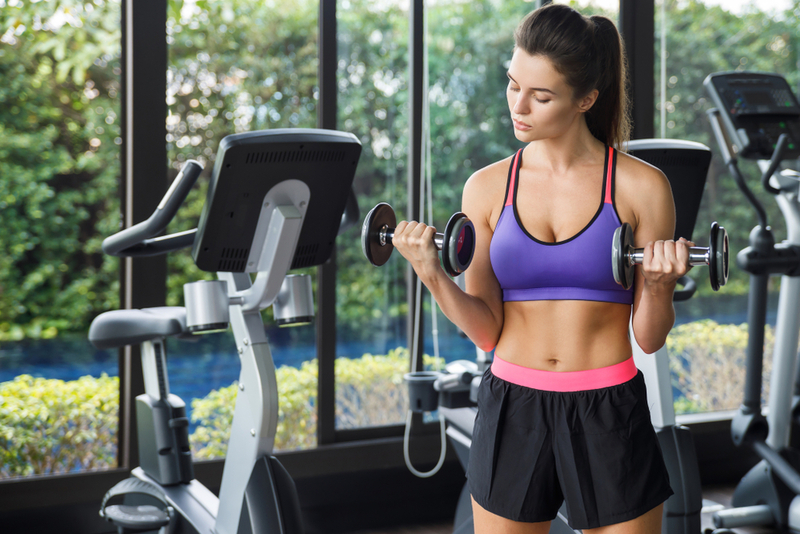 Summer is the season of tank tops and sundresses, so it's a great time to focus on toning your arms. Not only are your sculpted arms going to look great, but you'll also be stronger than ever and feel great! Read on to discover our favorite exercises to define your shoulders, biceps, and triceps. All you need is a pair of light dumbbells to get started. Choose a set of dumbbells that feels comfortable to you, weighing between 2 and 12 pounds. Peform each move 10 to 15 times. Repeat this workout 2 to 3 times. Note: Remember to check with your doctor before starting any new exercise regimen! Stand up straight with a dumbbell in each hand. Keep your elbows close to your body and rotate your palms so that they are facing forward. Exhale as you slowly curl the weighs up to shoulder level. Inhale as you slowly lower the dumbbells back to starting position. Holding a dumbbell in each hand, bend forward from your hips, with your knees slightly bent. Bend your elbows at a 90-degree angle and keep your palms facing in. Now, while keeping your upper arms stationary, exhale as you extend your forearms behind you. Pause and inhale as you lower your arms back to starting position. With a dumbbell in each hand, stand up straight with your feet about hip-width apart. Bend your elbows at 90-degrees and raise your upper arms to shoulder height, palms facing forward. The dumbbells should be at about ear level. Push the dumbbells up and in, directly over your head, before lowering again to starting position. Lie face down on the ground with your feet together. Position your palms on the floor about shoulder-width apart with elbows pointed towards your toes. Curl your toes under so the balls of your feet are on the floor, and then raise yourself using your arms. You should have a straight line from your head to your heels. Pause for a moment before lowering yourself back to the ground. In need of some dumbbells? Check these out!